With it being back to football season, I have been thinking about how badly I need to finish my St Louis A to Z. I mean I stopped at R and obviously that letter is getting a bit of attention these days! So we will start with the obvious one and then I have a few more to add in. Having grown up in Memphis, football never was my thing. That was reinforced when I went to a small liberal arts college without a program. But when I lived in New York, the number of teams within a few hours and the passionate fans I called dear friends meant I started paying a bit more attention to it. I had the chance to see the Giants and Eagles play and started following the Carolina Panthers later thanks to my sister & Memphis football star DeAngelo Williams. 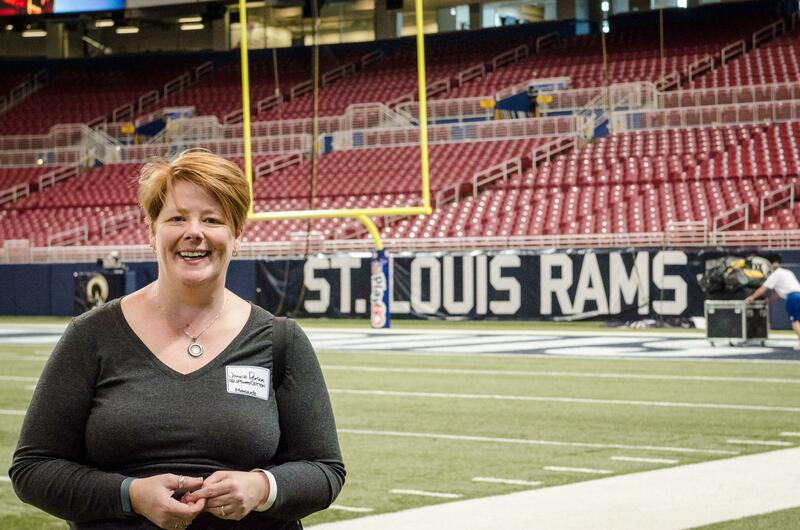 So when I decided to move to St. Louis, I figured football would be part of my new hometown experience. I have been very lucky with some incredible rams experiences! As you see up top, I have had the chance to go down on the field as a volunteer for the America’s Farmers farmer appreciation game! Granted we were only there before the game not during, but players were running warmups and it was pretty awesome. The Rams blue & gold is a common sight around town. They have had a relatively recent change in coaching and it seems there is a new energy going on. That’s a good thing for sure! Throughout the evening (which included us bowling with the players) we had a chance to chat with the various players but I feel like I got to know Quinn a bit better than the others since we were on a team together. (Yes, I realize I just said exactly the same thing my friend Val’s son Evan said recently LOL.) But maybe what makes me think that way is how relaxed all of the players seemed. We had linemen messing with us as we asked if they were on the team. They decided to be coaches but not really coaches. It took a while to see they were joking and when we realized what was up, we all had a great laugh. Then they all posed for photos with us! 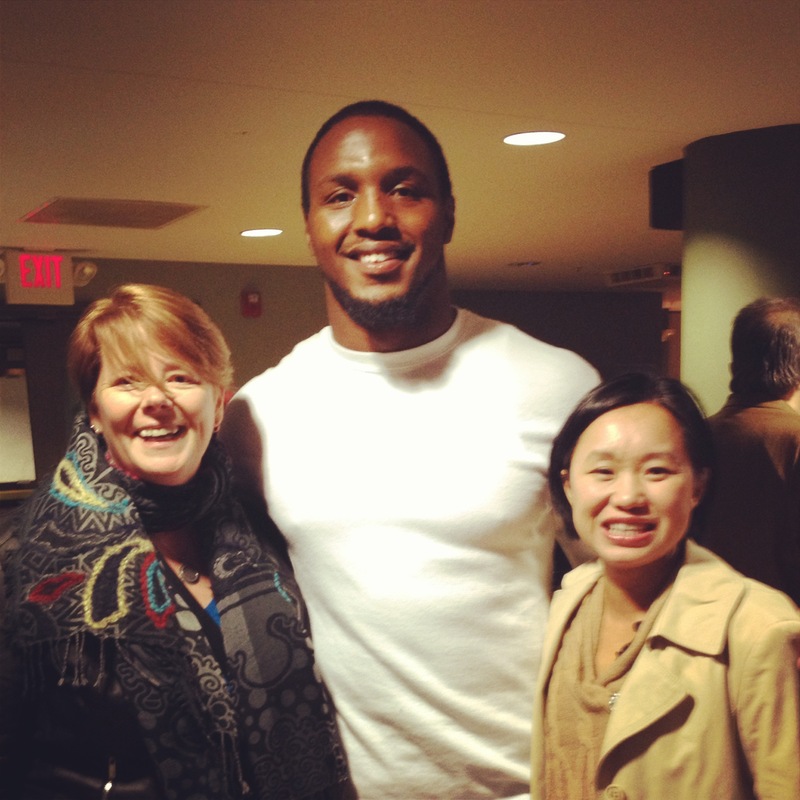 But probably what stands out is that since it was just before Thanksgiving, Quinn had his family in town. They felt like my people. A bunch of Southerners excited to be visiting family for the holiday. Quinn even had the kids in the family helping him bowl! Sure, we could have been putting more points on the board if he was rocketing that ball down the lane (and I swear he could throw that thing in a way it never touched that ground) but it was so much more fun to high five everyone, to take turns letting little kids help, etc. Besides, the time for competition is on game day! I love that as I was coming up with ideas for the STL A to Z, my blogging friend Katie McFarlane of Mom’s Little Running Buddy asked whether I would include running as the R of the alphabet. I love it! St. Louis is definitely a place where lots of us enjoy outdoor sports (I’ll use good weather as a caveat. 😉 Katie has prepared a Runners’ Guide to St. Louis that you really should check out! 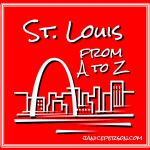 The A to Z series about St. Louis was supposed to be finished in April but hey, life gets in the way. I’m going to try to get the rest cranked out so feel free to suggest topics for the upcoming letters or call me out for missing a critical piece on today’s post. You can see what else in St. Louis gets a shoutout in the A to Z or check out last year’sA to Z of Agriculture. I have been waiting for you to post on the RAMS!!! CanT wait to get out there & see a game. I’ve seen them vs 9ers in Ca but never in STL…thank you for this post!! Brockers, Long, Laurinatis & Bradford are my favs! Too funny! Laurinitis was one of the funniest guys we met! Dang they made me feel like a dwarf! Love STL’s R…Thanks for the shout out. Hope we get to keep our Rams. Right?! I really do! I was at the Edward Jones dome yesterday and have to admit it was an eery feeling.